Your Mitochondria Need CoQ10! Do They Also Need PQQ? The latest answer seems to be a resounding YES, Your Mitochondria Need PQQ! Researchers are convinced that PQQ, (Pyrroloquinoline Quinone), plays a critical role in the growth and development of mitochondria throughout the body, even the brain. 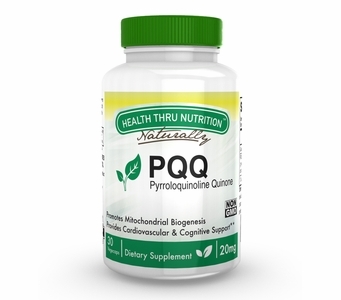 PQQ has a unique ability to stimulate cell-signaling pathways involved in cellular energy metabolism plus, mitochondrial function and development. In fact, PQQ is key in enabling cells to undergo spontaneous mitochondrial biogenesis. Biogenesis is the production of new living organisms or structures within individual cells. Spontaneous mitochondrial biogenesis, initiated by PQQ, is essential for human health and longevity. If you inhabit an aging body, (and many of us do! ), or have other health issues that affect the function of the mitochondria in your cells than PQQ from Tishcon should be considered just as essential to optimum mitochondrial performance as is our bio-enhanced Coenzyme Q10. Other Ingredients: Hypromellose, magnesium stearate and silicon dioxide. Free of: Milk, egg, fish, shellfish, tree nuts, peanuts, wheat, soybeans & gluten.